Each bungalow has a short flight of steps leading to it, and its own private patio with table, chairs, parasol, sun beds, built in barbecue (charcoal provided), which are very suitable for sun bathing in fine weather. “GWEL TREGEW” also has the benefit of a second smaller very secluded patio at the side, which is reached by a few steps and is a real sun trap in good weather. 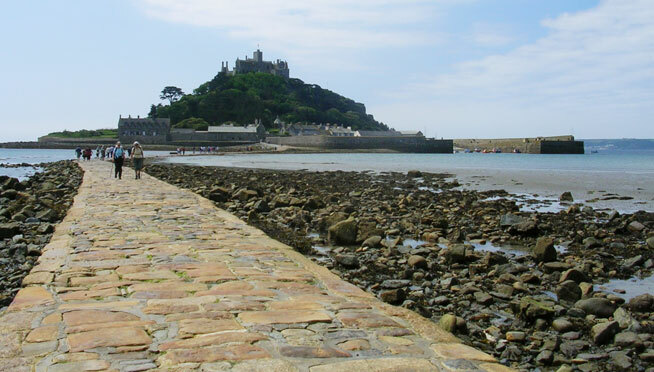 Both bungalows overlook St. Michael’s Mount, Mounts Bay, the Atlantic Ocean, and have beautiful views across Mounts Bay to Penzance and the fishing villages of Newlyn and Mousehole. The hills which surround the Bay provide a striking back drop especially at sun set with the patios being just the place to relax in the evening with a drink and meal, watching the sun setting over the Bay and hills. So it will come as no surprise to you that we have guests who return year after year, booking at the end of their holiday for the following year. Luxuries: Sea view and patios. Other: Linen provided, please check with the owner regarding towels. Access: Each bungalow has its own parking space in our private driveway.